The game takes place on a dystopian Mars, hundreds of years after the first human colonies set foot on its red plains. Today’s trailer showcases a few of The Technomancer’s unique environments and dangers. Pursued by a corrupt police force, you must journey across these deadly environments and beyond, chasing a secret that could alter Mars and its inhabitants forever. Your adventure on Mars begins summer 2016, available on PlayStation 4, Xbox One and PC! Spiders studio is back with The Technomancer, a sci-fi RPG for PlayStation 4, Xbox One and PC set on Mars during the War of Water, where an aspiring Technomancer faces a myriad of questions as his future grows threatened by the secrets of his past. 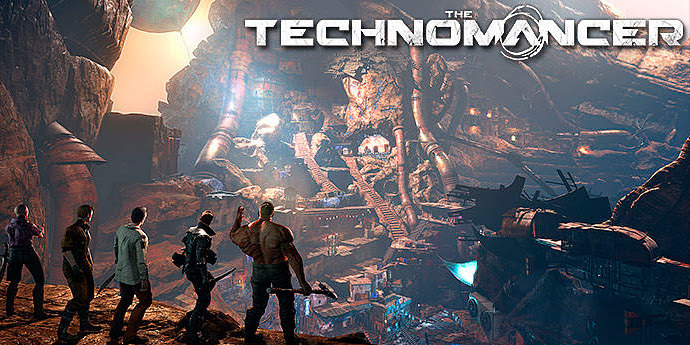 An RPG, The Technomancer will offer players action-oriented combat gameplay along four different skill trees, focusing on 3 different fighting styles and the destructive electric-focused powers of the Technomancers. But all situations aren’t necessarily to be dealt with brute strength, with dynamic conversation dialogue playing a deep role in quests, changing the story depending on the decisions you make. Craft equipment, weapons and armor for yourself and for the companions you’ll recruit along your adventure, nurturing relationships with them. Faced with the cruelty of Mars’ iron-fi st enforcers and alien wild-life, can you survive long enough to uncover the truth behind The Technomancer? Spiders is an independent video game development studio based in Paris, France. Founded in 2008 by several industry veterans who worked most notably on the Silverfall game and its add-on, the studio is mainly specialized in the creation of action/RPG games on PC and next gen consoles, but also has the capacity to realize or participate in the realization of PC ports on consoles. To date, Spiders developed and released Faery: Legends of Avalon, an enchanting RPG on PC, Xbox Live Arcade and Playstation Network, as well as the console ports of the Sherlock Holmes vs. Jack the Ripper (Xbox 360) and The Testament of Sherlock Holmes (PS3, Xbox 360) adventure games. Spiders has also developed Of Orcs and Men, an RPG for PC, PS3 and Xbox 360 designed and produced by Cyanide, Mars War Logs (PC, XBLA, PSN) and Bound by Flame (PC, PS3, PS4, Xbox 360). Spiders is currently developing The Technomancer for PC, PS4 and Xbox One. Focus Home Interactive is a French publisher based in Paris, France. Known for the quality, diversity and originality of its catalogue, Focus has published and distributed original titles that have become benchmark titles worldwide, available both in store and for download across the world. Focus publishes games on all major platforms, consoles and PC. 2015 has been exciting with the release of games such as Blood Bowl 2, Divinity: Original Sin on consoles, Act of Aggression, and Farming Simulator, among others. The publisher’s catalogue will get even richer the coming months and years with eagerly awaited games such as Vampyr, The Surge, Mordheim, Space Hulk: Deathwing, Battlefleet Gothic: Armada, The Technomancer, Shiness, and many more.